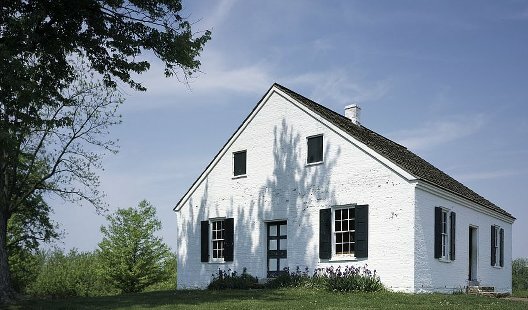 The home page of Antietam on the Web is really just a simple table of contents decorated by a photograph taken on the battlefield. 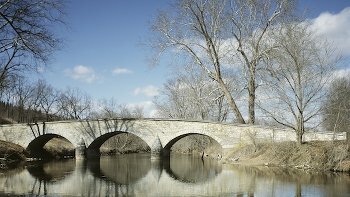 Since I did a major redesign/simplification of the site in 2010, I’ve used about half a dozen pictures to represent the place and the history of Antietam. Here are their stories. The current AotW home page picture, the beautifully lit Dunker Church (below), and the previous one – of the iconic Burnside Bridge (top) – are the work of Carol M. Highsmith. 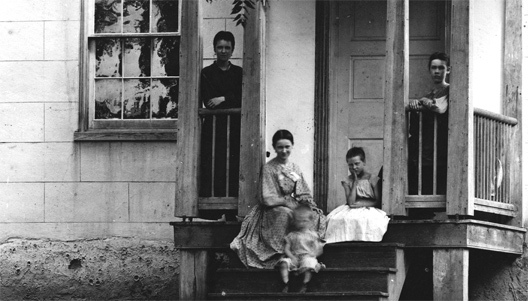 Ms Highsmith has been traveling the country to capture the architecture and landscape of America since 1980. Thousands of her marvelous photographs are available free of copyright in a massive collection at the Library of Congress, thanks to her generosity in donating all of her pictures to the public. You can see more about her and her work on at her own website. I am attracted most to the rich, highly saturated color she captures in these modern views of the battlefield; the visual pop she brings to scenes I’ve seen many times on visits to the Park. I expect these two images in particular are instantly identifiable to most Americans. The next most recent image on the home page was also taken at the former Rohrbach or Lower Bridge, but under very different circumstances. In addition to the interesting subject matter and the topical appeal of the bridge, I found this one a delightful visual pun: it’s not the Lincoln one might expect at Antietam. It’s from one of series of promotional photographs featuring the newest Lincoln touring car taken at the battlefield sometime between 1922 and 1926 by the Ford Motor Company. These also included one shot near the Observation Tower at the Sunken Lane. I think the car is at least a 1924 model, judging by the shiny radiator shell, but I’d be happy to have expert opinion on that. 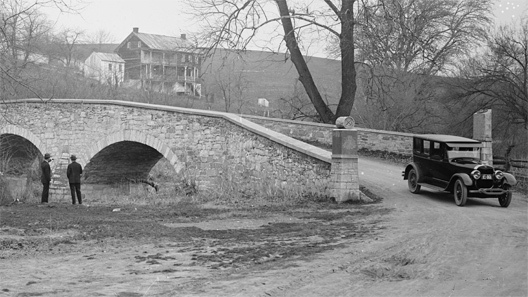 Most notable in this view, apart from car, are the monuments perched on stone piers at the corners of the bridge. These honored 4 Federal regiments who fought there on 17 September – the 2nd Maryland, 21st and 35th Massachusetts, and 51st Pennsylvania Infantry – and they were moved to their current locations on ground just east of the bridge in the early 1960s. 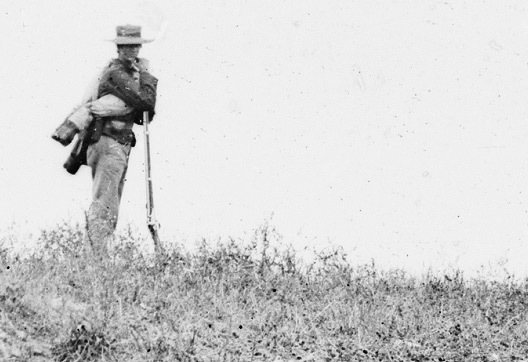 Lincoln at Antietam. Great fun. Probably taken by Alexander Gardner in the days immediately after the battle, this photograph is fantastic for the people in it. I’m not an expert on the David R. Miller family, but after zooming in a little on this picture, I’m sure one could identify these young faces. I can only imagine the horror they had seen after some of the bloodiest combat in history took place in their cornfield, orchard, and woodlot. Perhaps I’m projecting, but I see profound melancholy in those eyes. The next image also pictures civilians at Antietam, and is placed at the Burnside Bridge, but with rather a different feel. I chose it because of the incongruity between the very idea of picnicking and the nearly unbearable tragedy that had just overcome the same physical space. Or perhaps the contrast only points out the resilience of people living with tragedy. From the uniforms, the subjects are two Federal soldiers and wives/companions, and they were photographed slightly less than a week after the fighting stopped there. One can’t tell if the soldiers were present at the battle or have come along afterward, or whether the photographer found them there or staged the event. That story, if known, would better define the photograph. It still makes me shake my head a little when I see it. The story behind the following photograph is much more clear. Here’s Colonel Turner G Morehead who commanded the 106th Pennsylvania Infantry in action between the East and West Woods at Antietam. 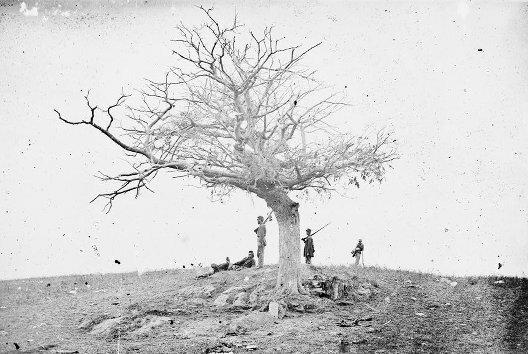 In his book on the photographs of Antietam, Bill Frassanito describes the research he did to locate the specific site of the photograph. 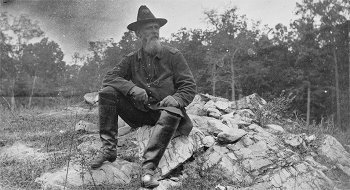 He could not do so, possibly because the outcropping was gone or hidden by the time he arrived in the 1970s, but he made a good case that the outcropping of limestone Colonel Morehead is sitting on was on ground over which he and his men had fought two days before. Mr Frassanito also described the 48 year old Morehead’s experience in action, which informs how I look at his face. As the 106th New York was retreating with the rest of Sedgwick’s Division from the Confederate flank attack in the West Woods at about 9:30 am, the Colonel’s horse was shot and went down, pinning him to the ground. Three of his men returned and helped free him, and he and they continued to flee northward. Morehead then noticed he’d lost his sword – a presentation from his men, which he’d sworn to protect – and went back for it. By the time he got back to his horse and the sword, Confederate troops were within yards and close enough to demand his surrender. He grabbed the sword and ran north, under fire but not hit, and reached safety in the woods near the Miller Farm with his Regiment. The last image here is a small detail, somewhat out of context from it’s usual frame, from a famous Gardner photograph made on the battlefield while burials were still underway – probably on 19 September 1862. It was the first AotW front-page picture I picked following a fairly drastic site re-build and streamline, and I was looking for a simple, streamlined visual message. I think the soldier gazing back at Gardner – and at us – speaks for all the soldiers who survived the battle and had a moment a few days later to ponder what it meant. Below is the full photograph from which the detailed view was taken. The single soldier above is the right-most of the four around the tree. Thanks to the detective work of Mr Frassanito, we know the main subject of the large photograph is the grave of Private John Marshall, Company L, 28th Pennsylvania Infantry under that tree on the Samuel Mumma Farm about 300 yards east of the Dunker Church. The Library of Congress cataloger called it the “Lone Grave”. Lone, but hardly lonely. Mr William A. Frassanito’s seminal work on the photographs of Antietam is Antietam: The Photographic Legacy of America’s Bloodiest Day, New York: Charles Scribner’s Sons, 1978. All the photographs in this post are available online and linked to their location at the US Library of Congress, Washington, DC. My great, great grandfather was Nathan Edmund Atkinson on my father’s side. Father is Thomas Logan Malone and his mom was Helen Potter Johnson. 4x Great-grandfather served w/NC 46th Co. K Great site. Very helpful with genealogy research. Thanx!! My great, great uncle, James Parnell fought with the Maine 7th regiment. Though a Quaker, he felt that the evil of slavery was worth fighting against. We died as a hero defending Washington DC.